Valentine’s Day is a truly LOVELY day filled with bright colors, music, poems and more to stimulate our emotions and senses! Retailers fill their aisles sugary treats, cards, stuffed animals, flowers and more! This holiday rounds out the winter season with comforts and fun but can also provide many challenges for those who have sensory processing disorders, cannot eat the boundless candy, or don’t enjoy the extra stimulating hooplah! How does one navigate your sensory-sensitive child in this sensory-heightened and sugar fueled day? Our Elite Therapy Center team of occupational, speech and physical therapy specialists provide some wonderful ideas to make your Valentines Day a truly LOVEly and sensory-friendly experience. There are many fun ways to SPREAD the fun in valentine crafting! Our OTs prepare simple and sensory fun crafts with safe but stimulating ingredients to produce the ultimate Valentine showcase! Great for littles and bigs, you can sit with your child and watch them create and play and finish with a clean up song and daily living activity. Puff paint made with washable paint, glue, and shaving cream. No measuring, just some of each. This is great for tactile play, scooping, hand strengthening, grasping, coloring. You can also add glitter. And make it into cute cards once it dries. It dries like puffy paint and is super soft to the touch when dry. So many options (add tissue paper, construction paper, glitter etc). 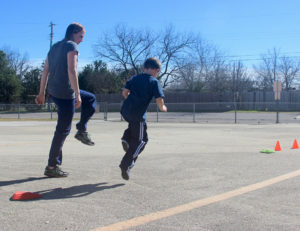 Games and exercise is a great way to show a love of movement. 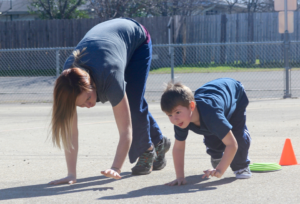 Whether inside or outside, work with your child to do fun exercises like easy stretching, crab walking, high knee walks, or any movement you are both able to achieve with comfort and confidence. If your child has a favorite song or loves to move around, use this opportunity to make it into a fun Valentine game! Great songs, great moves and SUPER SMILES! 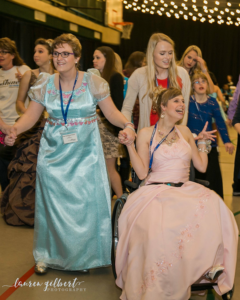 If your child is in a wheelchair or uses special equipment for walking, you can find a good space, turn up that phone and play a song to dance to! You can move their chair gently to the music, or move side to side and mirror their moves and actions. The act of enjoying a song and moving is great fun! 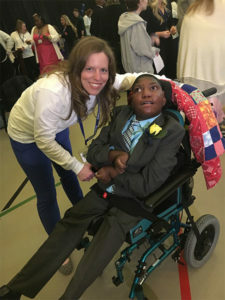 Our Elite Therapy Center Team shares fun experience from the most recent ‘Night to Shine Prom’ with Tim Tebow Foundation and ‘A Starry Night’ dance for children with special needs.